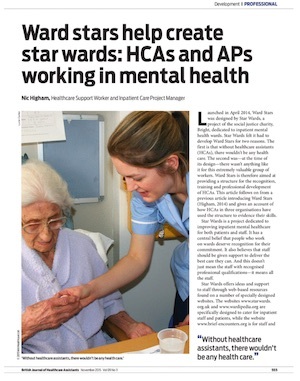 A few months back I wrote an article for British Journal of Healthcare Assistants about the exemplary work three organisations have been doing to embed and develop ‘Ward Stars’, our achievement and development scheme for mental health support staff. Here’s a taste of the article and a link to download it in full. This article follows on from a previous article introducing Ward Stars and gives an account of how healthcare assistants in three organisations have used the structure to evidence their skills. We developed Ward Stars for two main reasons. The first is that without HCAs, there wouldn’t be any health care. The second was—at the time of its design—there wasn’t anything like it for this extremely valuable group of workers. Ward Stars is therefore aimed at providing a structure for the recognition, training and professional development of HCAs. Star Wards is dedicated to improving inpatient mental healthcare for both patients and staff. We have a central belief that people who work on wards deserve recognition for their commitment. We also believe that staff should be given support to deliver the best care they can. And this doesn’t just mean the staff with recognised professional qualifications—it means all the staff. We heard from 3 organisations in particular who have adapted and implemented Ward Stars. It was incredibly heartening to hear directly from the fab HCAs and patients who have experienced Ward Stars. Nothing beats real-life stories. These organisations are different, but have a backbone of committed and talented HCAs who, with others, have proactively taken Ward Stars to the heart of their services. This article is both about them and dedicated to them. Ward Stars is structured around seven ‘Stars’, each of which is focused on the main themes of therapeutic inpatient care, represented by the acronym ‘IMAGINE’ (learn more about the Stars here). The Stars provide a unique set of values, skills, and attributes. Big thanks to the people who contributed to the article and to the journal’s editor, Peter Bradley, for kindly letting us share it. Visit www.wardstars.org and get started today!